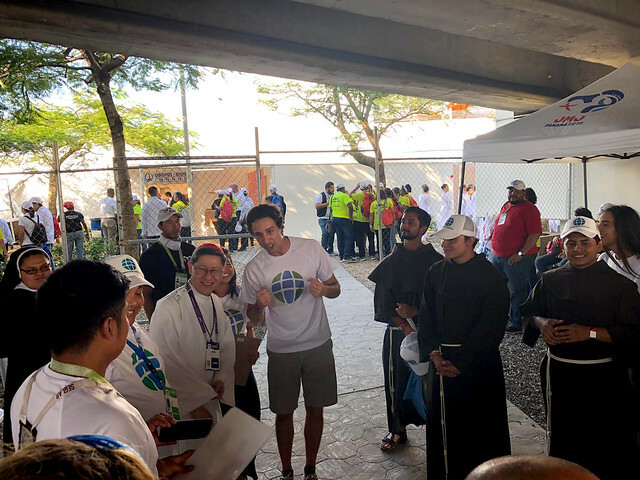 On Wednesday January 23rd, Development and Peace – Caritas Canada helped Caritas Internationalis provide World Youth Day pilgrims with a true experience of the Culture of Encounter in Panama City. The event, attended by over 800 people, was a silent play called “The Face of the Other,” which guided pilgrims to interact with each other in silence, prompted only by instructions given through headsets in their own language. As pilgrims moved wordlessly around the room, they were instructed to point out their wounds – both physical and emotional – to someone with a different coloured headset than their own (green for Spanish, blue for English), to close their eyes and trust this partner to lead them around the room, and to entrust to their partner a valuable personal item for two minutes as they mingled around the room. Although no words were spoken by the pilgrims for the 35-minute duration of the play, the emotions from the strong connection they developed with their partner were palpable. By the end of the play, the room was filled with people – strangers some 35 minutes ago – hugging and exchanging contact information. After Cardinal Tagle blessed those in attendance and sent them off to continue to create a culture of encounter upon their return home, the pilgrims participated in a 2 km Solidarity Walk from the theatre to downtown Panama City to witness Pope Francis’ arrival at the WYD celebrations. Rebecca Rathbone, who represented Development and Peace in the Caritas WYD delegation, added her 2kms from this walk to Development and Peace’s national total to help us reach our goal of walking 40,075 km (the equivalent to the Earth’s circumference) in solidarity with forced migrants by August 2019. The silent play was organized in collaboration with Italian NGO Non Dalla Guerra (http://www.nondallaguerra.it), and Italian theatre group La Piccionaia (http://www.piccionaia.it ). Caritas commissioned these two groups to develop this version of the play to fit the theme of the Share the Journey campaign. The event last Wednesday was carried out by youth who attended WYD as part of Caritas’ delegation, representing nine different Caritas member organizations from around the world. Overall it was a truly international effort that was beautifully pulled together, and that successfully left pilgrims with a true understanding and personal experience of the culture of encounter. As our WYD event shows, it doesn’t take long (as little as 35 minutes!) to truly encounter the other. We look forward to continuing our 51-year tradition of helping Canadian Catholics to Share Lent, by helping you to Share the Journey with the 68.5 million forced migrants around the world and those who work tirelessly to assist them.